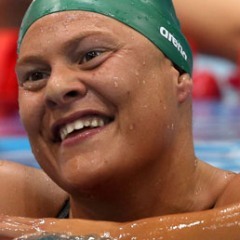 London - Natalie du Toit will prepare for the closing chapter of her swimming career on Friday after powering her way into the women’s S9 freestyle final at the London Paralympic Games. She swam her heat in 1:02.95 to qualify for her last ever competitive swim, two seconds ahead of her nearest rival Australia’s Ellie Cole. Du Toit, who still held the world and Paralympic records -- 1:01.08 and 1:01.44 respectively -- said she was looking forward to her final race. “I’m excited because it’s been a long 10 days for me,” said the single-leg amputee who promised herself she would pack up her swimming trunks when she turned 28. “I’m a bit sad too, but the next couple of months will be busy with sponsors and those people who have really helped me along the way. She said she has had several months to reflect on her achievements but was not quite sure where her future lay. “Swimming has taken up many years of my life and taught me a lot of lessons,” said Du Toit, who would be competing for her eleventh and last Paralympic gold medal. “Travelling the world has been a real eye-opener and it’s always going to be sad leaving the sport. “But, looking back, it’s not just about inspiring a generation, it’s about showing people it is possible. “Hopefully, people go out there and live life to the fullest, whether it be disabled people, old young or whatever. Emily Gray, who competed in the same heats, was unable to qualify for Friday night’s final. Hendri Herbst and Charles Bouwer, both visually impaired swimmers, also qualified for the respective finals. Herbst, who earned a bronze medal a week ago in the men’s S11 100m freestyle event, set an African record in 5:08.87, finishing fourth in his heat and scraping into the final. He will meet familiar competition in Bradley Snyder, from the US, who qualified fastest in 4:33.70. Bouwer, with a gold and two silver medals already in his pocket, will have his work cut out against the irrepressible Belarusian, Ihar Boki. Boki, who set his fourth world record at these Games, was fastest in his heat, in 2:09.89, with Bouwer swimming in his wake to finish second in 2:15.28. ** Sapa reporter is in London as a guest of the SA Sports Confederation and Olympic Committee.